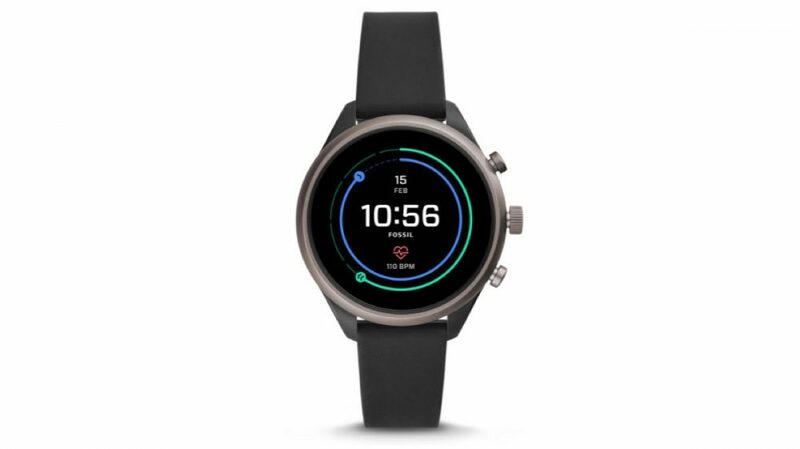 Fossil is a company that is recognised all over the globe for their quartz watches and recently they have launched an affordable smartwatch called Fossil Sport Smartwatch. It has a circular touchscreen display and has easy swap silicon straps. The smartwatch is water resistant and has many features like GPS navigation, heart rate tracking and customisable dials. The Fossil Sport smartwatch has a circular 41 mm case which is 12 mm thick and is made form Nylon and Aluminium. The smartwatch has a touch screen display to display time and content. It has an 18 mm wide silicone strap that can fit wrists of sizes up to 19.5 cm. The Fossil Sport also has a side mounted crown and two push buttons. It has a 5 ATM water resitance rating hence, it can be easily survive a swimming session. In terms of sensors, the smartwatch has an accelerometer, altimeter, ambient light sensor and NFC support. The Fossil Sport smartwatch runs on the latest Snapdragon 3100 SoC and has 4 GB of inbuilt storage. It uses WearOS by Google, which is specially developed for smartwatches. The watch is compatible with both Android and iOS devices running iOS 9.3 or above and Android 4.4 or above. It connects to your smartphone via Bluetooth 4.2 and also has Wi-Fi 802.11 connectivity. Fossil claims the smartwatch has a battery backup of up to 24 hours depending on usage It also has a low-power mode that can give 2 days of additional battery backup with all smart features turned off. You can charge the watch via the magnetic plate which can fast charge it up to 80 % in just one hour. The Fossil Sport smartwatch has a heart rate tracker and an activity tracker to track your fitness levels. It can display notification for e-mails, alarm clock, alerts, calendar, app alerts and even text messages from your smartphone. The watch supports wireless data syncing with user’s phone and also support Google Pay services. It has a built-in microphone that perform a variety of tasks on your smartphone via voice commands. One key highlight of the smartwatch is its untethered GPS navigation capabilities. This feature allows to navigate destinations without even connecting to a smartphone and the built in 4 GB ROM can store music for your running sessions.